All masters for CD/DVD replicating could be accepted with a burned CD-R, DVD-R, DLT, or a DDP archive. All masters for CD/DVD authoring could be accepted with any format data includes and/or video, audio, photograph, letter contents. All artworks design for printing CD/DVD label and cover would be accepted to use the software by Coreldraw, Photoshop Illustrator, Acrobat, or Indesign, save the file as cdr, psd, eps, ai, pdf, or indd archive at least 300dpi resolution. Also attaching an image in jpg format for the reference. 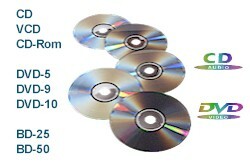 Any enquirement of CD/DVD cost be welcome to service@yessir.com.tw to get an estimation. To send us artwork attached onto yessir.sales@msa.hinet.net or upload to your ftp address. To ship master to the address of yessir co. Taiwan by EMS (the Post) or a forwarder. To sign an Authorization Copyright which describes the ownership of CD/DVD belongs to you. To transfer the payment by bank in advance or L/C at sight for the purchase order. since we got your master and artwork, also the printing image has been approved. To delivery to Asia aera, Mainland China, Japan, and Australia within 2∼3 days. To delivery to Europe, America within 3∼5 days. To delivery to Asia aera, Mainland China, Japan, and Australia within 10∼21 days. To delivery to Europe, America within 21∼28 days.